Despite a few erratic weather patterns from the west, Anna Maria Island fishing is shaping up to be an excellent spring bite. Spotted seatrout are making a showing on the deeper grass flats in Tampa Bay and its inland waters to the east. 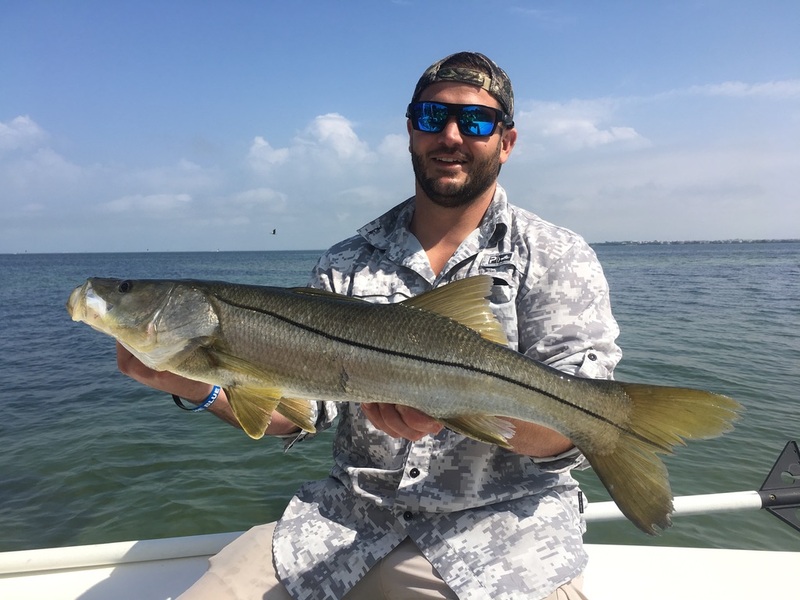 The same applies of catch-and-release snook which have made a bold showing in these areas. Fishing structure in Tampa Bay is yielding fish, especially sheepshead. Reports from the Rod & Reel Pier recommend that now is the time if you’re a sheepherder. Fishing along the beaches of Anna Maria Island is another option as there are numerous whiting and pompano foraging on sand fleas up and down the shorelines. And don’t forget there is black drum and catch-and-release redfish action occurring around residential docks and canals. You might want to act quick on that one though, as I feel those fish are going to be dispersing as the water temps rise. Lastly, reports from offshore are boasting of large amberjacks, mangrove snapper, permit and catch-and-release gag grouper. Things are looking good. On my Southernaire fishing charters, clients are experiencing some of the goodness. With the arrival of white bait on the flats, the door to catch-and-release snook action has opened. In fact, that thing just flew off the hinges. Morning rallies of catch-and-release snook are shaping up nicely with catches of 20-30 fish in a morning. After snook fishing, I’m patrolling deeper grass flats for spotted seatrout. Some mornings are producing limits of fish — 15-20 inches —other mornings are a little more tough, especially right after a front. Switching over to live shrimp as bait is providing action around rocks and docks. Large, pre-spawn sheepies are still available in some spots. Mixed in are mangrove snapper and some grunts. Fishing docks on the windier days is always a good bet for some catch-and-release redfish action. While targeting the reds I’m seeing some black drum and a flounder or two.